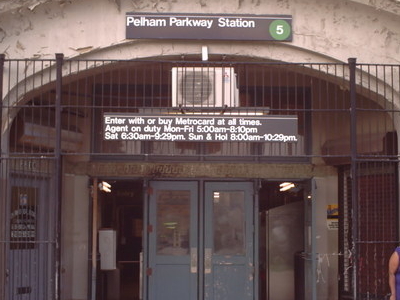 Pelham Parkway is a station on the IRT Dyre Avenue Line of the New York City Subway. Located at the intersection of Pelham Parkway and the Esplanade (erroneously signed as "Esplanade Avenue" in the station) in the Bronx, it is served by the 5 train at all times. This station was originally opened on May 29, 1912, as an express station of the New York, Westchester and Boston Railway, with two island platforms and four tracks. It was closed on December 12, 1937, after the NYW&B went bankrupt but was opened again when the City of New York purchased the Bronx portion of the railroad for use in the subway system. Today, the two local tracks remain in revenue service, and the southbound express track remains in use as a test track. The northbound express track ends just south of the station. The station is designed with two island platforms however it is not considered an express station.Pelham Parkway is the only completely underground station on the Dyre Avenue Line and the only underground station not built as a Subway station. Here's the our members favorite photos of "Metro Stations in New York City". Upload your photo of Pelham Parkway IRT Dyre Avenue Line Station!